Yesterday morning I received my Ultimaker 2+ brand spanking new out of the box. My friend Ryan Beltran, founder of elequa, helped with the unpacking and it felt like Christmas morning. The printer gently crafted the test robot print with finesse, delicate and precise were it's movements, and I was one happy camper. Fast forward to the second print, a two hour job that would have produced a water purification device of my own design. While on a Skype call and watching the printer run I noticed something was wrong. I paused the printer, then started it again and the problem continued. My Skype friend, a new business partner (possibly), noticed I was preoccupied and scheduled a routine of calls in the future. Fast forward to now. Its nearly 3 AM the next day and I'm just so very disappointed with how very badly this printer just literally destroyed itself all because of a simple extruder clog. 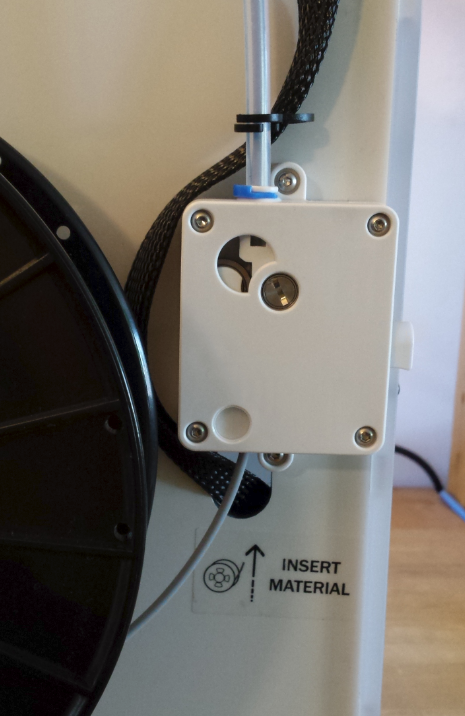 It seems that the webbing around the wires that goes to the print head, well it had gotten tangled with the filament and the printer's Hobbed Bolt (or equivalent drive mechanism) dug into the filament, making it ever so slightly wider than it originally was, such that it got stuck in the Bowden tube. The filament then proceeded to travel up the length of the tube to nearly fully at the end but stopped at about three quarters of the way there. That's when it built up enough friction to clog the Bowden tube. Not realizing the source of the problem, and unable to pull or push the filament, I felt that there must be an extruder clog (though it was really a Bowden tube clog), so I looked through the sparse Troubleshooting Help and to my dismay found nothing about clogs in the feed path. Disappointed with no help on such an obvious problem, I proceeded to remove the backing plate of the extruder. Then for some reason I decided to put the plate back on and did so. The upper right screw would not tighten all the way. Next I removed the whole extruder and watched the "captive" nut for the upper right screw fall out. No problem, I just put it back into place on the extruder. Next I dealt with the clog which of course was extremely difficult. I ended up using the end of the Bowden tube to pry out the filament just a smidgen of length at a time (prying with my flush cutters), and in the process decided to open up the other end of the tube to push on the rope with some loose filament that I cut from the spool for this purpose. Between the pushing and the prying I managed to clear the tube. That's when I saw the clog was due to the Hobbed bolt or gear had dug into the filament. What cause that? Oh yes, as I mentioned before it was the cable netting getting caught in the filament feed. So next I had to disassemble the hot end to find the little blue clip that had fallen into it, then I reassembled the hot end. Next I went to go put the extruder back on and I noticed the adjustor with the five little marks on it, that is supposed to be left in the middle, was at the top position. No amount of torquing the adjustment screw would fix it, so I presume that my blunder of taking the backing plate off of the extruder to get a look at it must have let loose a key little piece of that assembly. Next I plan to disassemble the extruder and put it back together to fix that adjustment device, and also in the process of prying out the filament the Bowden tube got ugly, so I cut off 1/4" (6mm) or so from the end so that it is nice and clean looking now. I will reassemble, check for proper operation of all pieces, level the bed, and then I have a decision to make. Do I want to keep such a maintenance nightmare or send it back in exchange for a Lulzbot Taz 5 if I can, or just give up any notion of having a printer at all. I cannot tell you how frustrating it was to do this on my own without any help from a search of the forum or the documentation, for a simple Bowden tube clog. I think now I see the wisdom of the direct drive approach, you don't have that damn tube clogging up on you. This, coming from a guy with 2.5 years experience in 3D printing, is really quite disappointing. My new printer, the object of joy, is no longer new. I just cannot keep riding the emotional roller coaster of printer repair. I want to use the funds to pay Shapeways and 3D Hubs to make my prints at this point. So upsetting! I'm very disillusioned at this point. Sigh. Actually now that I got that off my chest, I feel better. 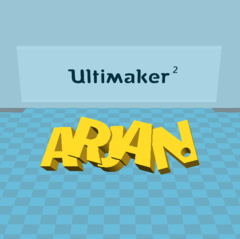 Maybe I'll keep the Ultimaker 2+ after all, maybe I have no choice, not sure of return policy for a printer I've so modified. It really is a thing of art and beauty, delicate, fast, nimble in executing it's precise and controlled extrusion. I feel better now... Next to see how to fix that extruder and then test it. I understand your frustration... it must be hard to receive a new "toy" and not be able to play with it. And of course when you run in an issue you can always ask here on the forum, where a lot of very talented makers can help you. Sounds like you had quite the evening! It sounds like you may not needed to open up the feeder, but with Didier tips you will probably be able to put it back together just fine. Make sure to let us know if you need more help! Reading your post, I'm not really confident I understand what caused your problem. I think I understand the wrapping around the main cable got caught up in the bowden tube, but I don't understand how that could happen. Do you happen to have pictures? Otherwise if heat crawls up your filament may expand and create another clog right there. If you make it too short, the angle will be steep where it has to reach over the frame or in your print head causing friction. Thank You All for your kind and patient responses! I have slept (twice!) and had a moment of reflection. Thinking out loud I truly was negligent in not reaching out to the community for support. It's kind of like a slippery slope. You want to fix it right away, then one goofup leads to another thingamafuzzle and next thing you know you have learned something the hard way instead of relying on the true experts. Ah well. In the photo posted, notice how the black netting wraps to the left, down, and tucks in the bottom? Well when I looked at my printer just after the clog, it was covering the upper left screw, and the bottom of it must have pinched off the flow of filament. I have gremlins around here, people who should know better than to play practical jokes on me, and that is always a possibility but really it probably just came loose during shipping and was an accident waiting to happen. The fact that there is no fastener there is in my mind a design flaw. Do you see what happened now? I will check that the Bowded tube is perfectly flat and recut with scissors if it is not. Also I will take the extruder apart and reassemble it so that the tension adjuster works again. Today I finish repairing this thing! Also will check linked references before continuing. Thanks again, I just gotta learn to lean on my community better!!! It will all work out, good luck! The top picture also looks like it has some under extrusion or something? What are the dark lines? Stringing could be fixed with improving your print profile, perhaps print slightly faster or hotter/colder. When your bowden tube is secured in your printhead with the white tightner and blue horse shoe, is there still any movement possible? Like when you pull it does it move up a little bit? If so this may undermine your retraction settings. Gotcha Sander, I will experiment with temperature and measure the filament's actual diameter to make sure the extrusion is ok, plus double check the Bowden tube. The cracks happened when I used my putty knife to lift the print off of the bed, not waiting for the glass bed to cool. Actually I think the infill of 20% is the culprit here. It is a thin-walled shape but with 20% infill it becomes two outer walls of 0.6mm and an inner space that is mostly void. To fix that I have bumped up the infill to 100%, though I wonder if bumping up the wall thickness would be better? either way, there will be more than twice the thickness of wall so the cracks will not occur so much when i remove the part from the bed. Bumping the wall thickness is generally a better idea. Depending on what you want to use your model for, with a thick wall, 2 or 3 lines you often don't even need infill. It is always wise to let the bed cool down, besides the fact it is hard to get off you may be deforming your print because of the warmth which is something you never want I think. My first print on the Ultimaker, it jammed and clogged, it melted enough PLA that molten PLA got stuck inside the bowden tube, I had to slap it across the counter over and over until it finally had enough force to send the clogged piece flying out of it. For a long time it seemed like every time I tried to print it was just failure after failure, and to this day I face a few issues here and there but that initial disappointment was a huge deal. These things are definitely high maintenance to a degree, but 90% of the time they run like a dream.